Address: Piteras, 20, Costa Teguise (Lanzarote), Islas Canarias. This attractive, modern apartment complex has a snack bar and 2 outdoor pools with sun terrace. Apartamentos Tabaiba Center offers a free shuttle to the beach resort of Costa Teguise, 2 km away. Apartamentos Tabaiba Center’s white buildings feature a unique combination of straight lines and smooth curves. Each modern apartment and studio has bright, simple décor and tiled floors. All apartments and studios have a private balcony and an airy living-dining room with TV. Kitchens include an electric hob, toaster and kettle. WiFi is available for an additional cost. 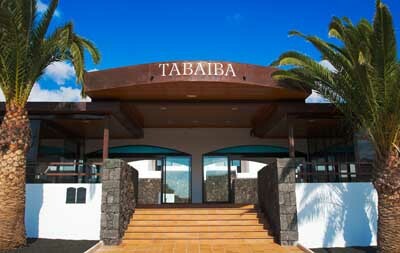 Staff at the Tabaiba complex can arrange car or bicycle rental and provide information about Lanzarote. Aquapark Water Park is a 10-minute walk away, while Costa Teguise Golf Course is 3 km away. You can enjoy tennis and padel in the surrounding area, and there is a children's playground on site.